If you’re seeking a budget-friendly shutter option that is as affordable as blinds or curtains, our Polytherm PVC shutters are the perfect choice. Our PVC shutters are exceptional quality and come in a range of 2-pack paint colours to suit your decor and home design and themes. These PVC shutters are excellent for shoppers with a reduced budget, who still want the visual appeal that shutters provide. If you have some unusually shaped windows that you thought might not be able to have shutters adorning them, we can help you make them beautiful. 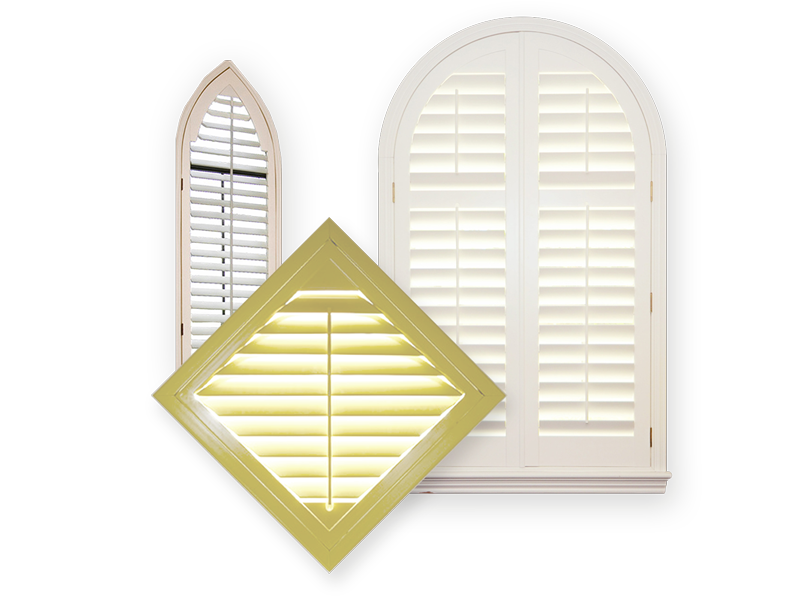 We specialise in custom shaped shutters for those unique window frames. Unlike curtains and blinds, our shutters will show off the shape of your window rather than just covering them. Sometimes that diamond shaped window might create a porthole from the outside world that you wish wasn’t there, encroaching on your home’s privacy. By allowing us to measure and quote for your custom shaped window furnishing, we can help provide your living spaces with the privacy and design aesthetic you need while still allowing natural light when you want it. Our premium custom shutter solutions bring a timeless, classic appeal to your home and can help create the desired atmosphere of your living spaces. We use exceptional quality products and our specialist team will come to you to measure and quote to ensure we are exactly meeting your needs and budget. When you really need to keep out the heat, protect your home from the ravages of a cyclone, or just make your home look 100 percent more awesome, PVC shutters are just what you need. You can buy yours from Sheerview Window Furnishings, where you’ll get great savings while also knowing you’re getting the best value for PVC shutters on the Gold Coast. Come on in and check out what we’ve got. You are sure to enjoy your shopping experience at Sheerview. How do PVC shutters compare to other materials? The main advantage you get with our PVC shutters is that they can be much stronger than materials such as wood or metal, while still having a very comparable weight. We use the strongest PVC Shutters in market making this the best choice for your home. This makes them very easy to handle, transport, and install. The cost is also significantly less than other materials. PVC shutters do not warp or rust, and they are not predated upon by insects. All wooden shutters will eventually warp if mounted in an outdoor environment. Moisture from the air, as well as rain and splashes, causes the wood to swell. Then heat energy from the Sun dehydrates the wood, which shrinks it again, and can lead to splits and cracks. Metal shutters can be subject to the ravages of oxidation, better known as rusting. This will especially affect homes that are close to the sea, which of course many homes on the Gold Coast are. Salt particles in the air act as a catalyst to accelerate the rate of oxidation in many metals. PVC shutters, on the other hand, are strong, light weight, and almost invulnerable to the forces of nature. They are waterproof, easy to clean, and they’ll stand up to a surprising amount of punishment. Safety is another reason to choose PVC shutters. They won’t give you splinters, they don’t conduct an electric current. What else is there to know about PVC shutters? PVC shutters are available in a range of different tints, which are added at the time they are manufactured. These shutters never need painting, and they’ll maintain their attractive looks for years and years to come. Because PVC shutters are a relatively recent innovation, they are very stylish and can be bought in a great variety of styles to suit just about any kind of home, from antique homesteads to the most modern concrete cubes, and everything in between. Why buy from Sheerview Window Furnishings? Sheerview is the best supplier of all kinds of window coverings on the Gold Coast. We have the biggest range of top quality products at value prices. Whatever you are looking for in window covering products, you will find it at Sheerview.